Should you have any questions or concerns please contact Customer Service. Since our products are food products, returns are not allowed. If you have questions or concerns with the quality of our products please contact Now Plating immediately. We will work as quickly as possible to make our product or services right. Cancellations of orders must be received no later than 1 week prior to your delivery day. Our delivery fee is $1.00 per mile and is determined by Google Maps from our kitchen to your doorstep (rounded to the nearest mile). All orders must be submitted and paid for online no later than seven days prior to your assigned delivery day. 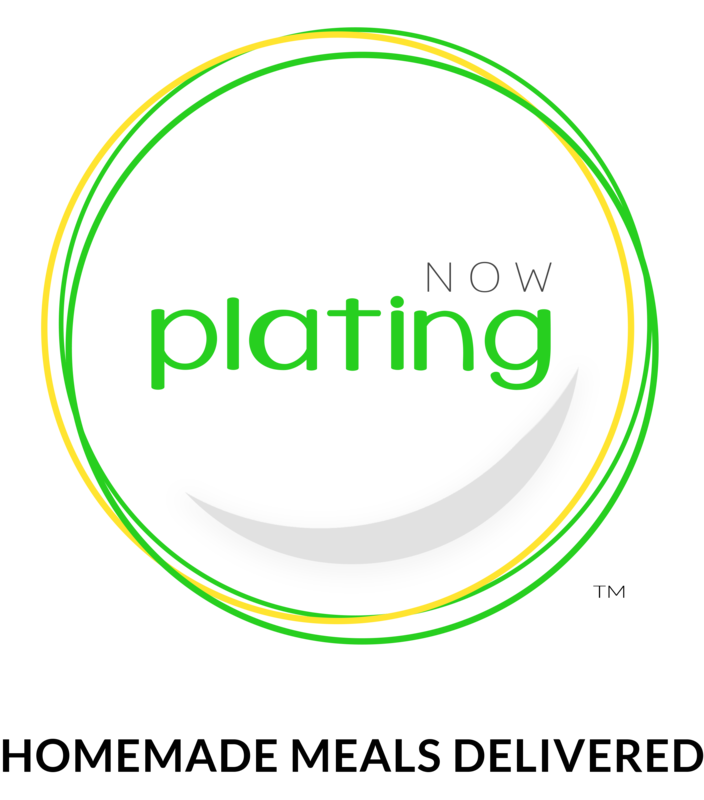 When you register with Now Plating we will determine the best delivery day for you. That day of the week will be your set delivery day for all future orders. Deliveries are made between 4:00pm and 9:00pm Monday through Friday. You will receive a text when your meals have been delivered. If the delivery day is changed you will be notified ASAP of this adjustment. Now Plating cannot guarantee that every meal we deliver will arrive exactly between the hours of 4:00pm and 9:00pm. In particular, in the case of inclement weather or other events beyond our control that interfere with Now Plating’s ability to deliver your items, Now Plating will try to deliver your items within the estimated window. If a timely delivery of your order is not feasible, Now Plating will deliver the next day. If your order arrives early or late, you agree that you will still accept your Now Plating order and release us from all liability for any loss, damage, or inconvenience that you encounter as a result of early or late delivery. Now Plating items will be delivered in sealed packages into an insulated cooler you provide. If a cooler is not available when Now Plating arrives, a one time use cooler bag will be left. We highly suggest that you plan in advance for your Now Plating delivery to ensure proper storage and refrigeration prior to consumption. You are solely responsible for inspecting all Now Plating meals upon receiving delivery. Now Plating recommends that you immediately refrigerate or freeze all perishable ingredients as needed. The condition and consumption of the Now Plating meals is completely at your own risk, and you are responsible for the correct handling, preparation, storage, cooking, warming use and consumption of Now Plating meals and ingredients upon delivery. We are not responsible for meals stolen following delivery. Delivery fees are $1.00 per mile from our kitchen to your doorstep. This is calculated via Google Maps. To qualify for delivery order minimum requirements must be met. Menus change weekly and future menus can be seen up to four weeks in advance. You can shop at Now Plating online with confidence. We work with Elavon, a leading payment gateway for over 20 years. Elavon offers safe and secure credit card and electronic check transactions. To learn more about their practices visit www.elavon.com. When you purchase from Now Plating, we may ask you to supply additional information relevant to your order, including, without limitation, your credit card number, the expiration date of your credit card, the security code, and your address(es) for billing and delivery. You represent and warrant that you have the legal right to use all payment method(s) represented by any such payment information, whether you provide it in the course of the sale or in connection with your Account. When you initiate a transaction with Now Plating, you authorize us to provide your payment information to third parties so we can complete your transaction. To charge your payment method for the type of transaction you have selected, you may need to provide additional information to verify your identity before completing your transaction. All sales are final. If something unexpected happens in the course of fulfilling your order, we reserve the right to cancel your order for any reason. If we cancel your order, we will refund any payment you may already have remitted to us. AS STATED ABOVE, ALL SALES ARE FINAL. To access most features of the Service, you must register for an account. When you register for an account, you will be required to provide us with some information about yourself (such as your name, email address or other contact information, phone number and delivery address). You agree that the information you provide to us is accurate and that you will keep it accurate and up-to-date at all times. When you register, you will be asked to provide a password. You are solely responsible for maintaining the confidentiality of your account and password. You agree to accept responsibility for all activities that occur under your account. If you have reason to believe that your account is no longer secure, then you must immediately notify us. Our Services are not directed to children under the age of 16. Now Plating does not knowingly collect personal information from children under the age of 16 without obtaining parental consent. Now Plating strongly suggests that parents and guardians take an active interest in the online activities of their children. If Now Plating finds out that we have collected personal information from a child under the age of 16, Now Plating will delete that information as quickly as possible.